UPDATE! A race horse trainer friend of mine has offered to pick up and deliver Muchacha to us in the next couple of weeks! What a huge blessing! We are so very grateful to her! You’re an angel Mary Alice Caesar Pattershall x0x0x We will post all about Muchacha once she arrives at our barn! The Lord has put this horse on our hearts to rescue and bring aboard to our ministry. She will given to us on a free trial basis and after that her adoption fee is very low. We are fund raising for transportation costs to bring her from her rescue to her forever home with us. Muchacha Grande was in a trailer accident, sold to slaughter, rescued and now has found a forever home after over a year of waiting. The only thing standing in the way is cost of transporting her to her new home! Can you help? ANY Amount is appreciated! The route would be from Airville, PA. to Quakertown PA. About a 2 hour trip one way. Thus the high quote amount ~ Thank you for any help! God Bless! 15.2 handsMuchacha, as we fondly call her, is one very sweet lady. We were told that she was involved in a horse trailer accident a few days before she was sold for slaughter. We found her in the meat pen with a look of not caring if she lived another day or died. She was very thin and had many wounds and abrasions all over her body. A few short weeks with us and she is a totally different horse. She loves attention, getting treats and grooming. You can do just about anything to her. Super companion with other other horses, gets along with both mares and geldings. She has had training under saddle and appears to know her job. We would recommend a low level intermediate rider or above. She would make a very nice family horse for light pleasure or maybe even a fun show here or there. We hope to have her home with us by August 1st. Any amount donated towards this cause, no matter how small is appreciated and a blessing to us! This entry was posted in Christian Ministry, Horses and tagged Christian, Christian Ministry, Christianity, Horse Rescue, Horse Therapy, Horses, Kids, Ministry, Non-Profit, Special Needs, The Lord's Lead Line. Bookmark the permalink. It seems like yesterday that my husband and I spoke about starting this ministry with horses & children. In reality, it has been about 11 years since that idea was planted in our hearts by the Lord. This series of articles is being written for two purposes. 1. To give you a little history of our journey with the horses specifically and tell you their stories individually. 2. To thank the people that have prayed for us, helped us start to network with families and given financial and spiritual support. I was born with a defect of sorts, a hole in my heart, a hole not in the literal sense, but a hole in the shape of a horse. From the time I was born, I loved all horses. I was privileged enough to fill that hole for a time when I was twelve years old. 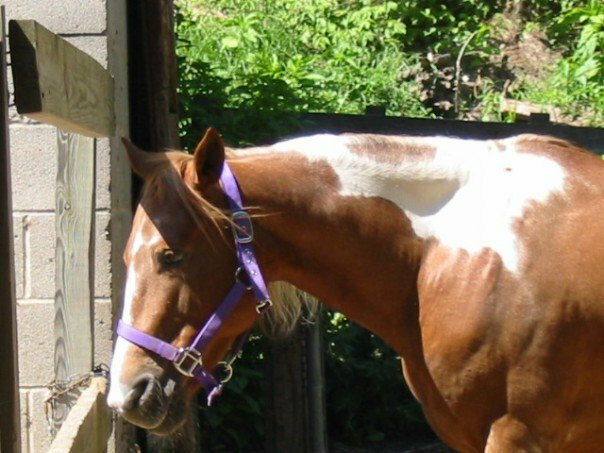 I was able to rescue and own a horse through high school and kept him at a barn in Northeast Philadelphia. Fast forward many years, now with a twelve year old of my own. One 4th of July weekend, I decided to take the family to visit the old barn then go for a family picnic in a park. It was during this visit that an old ex-stable mate’s daughter pulled me aside and asked if my daughter would be interested in taking care of and riding a pony that she and her mom had recently rescued from the New Holland Auction. This pony had a three month old foal by her side and was blind in one eye. She was taking care of and training the foal but, they wanted someone to give some TLC to the momma as well. I had no idea what to think, say, or do. Our intent was to come for a quick visit, say hello how’s it going after all these years, pet a few horses and then head on to the park for our picnic and fireworks not get into commitments of caring for a pony. We were told that she was somewhat shy of people and was purchased for this ex-stable mate’s niece who wanted no parts of the pony. 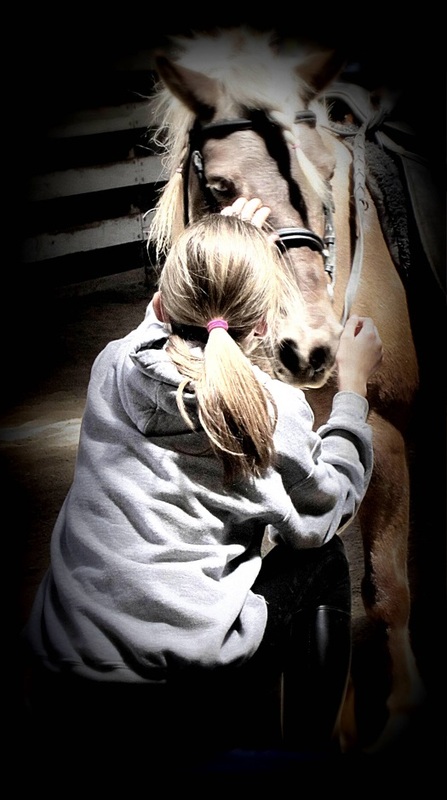 My daughter entered the pony’s stall and it was love at first sight for both of them. Oh great! (Insert best sarcastic voice here). 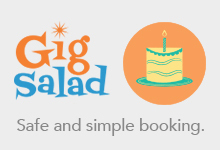 Well, how could I refuse? 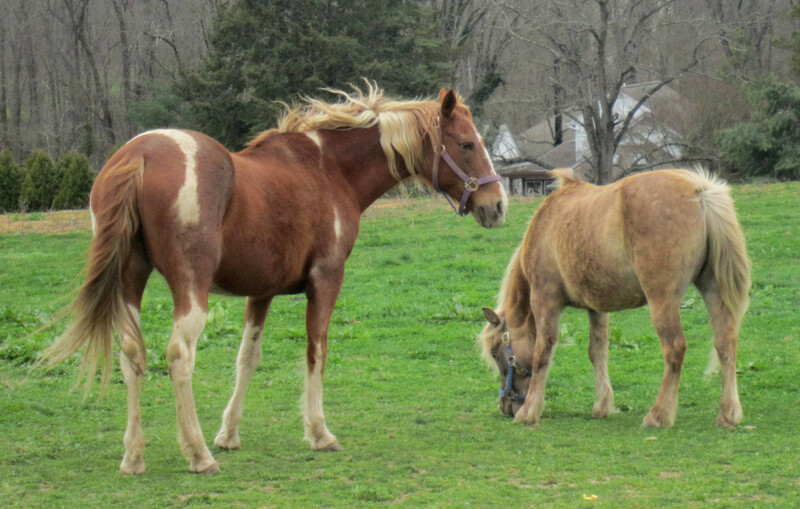 They were not asking for any money, just help with some stalls in exchange for helping to care for and ride this pony. Sensations of the deep, hot ache through the once empty horse shaped hole in my heart shuddered through my body. I knew that God must have arranged this meeting so I prayed that He would show me what to say and do. Well, we agreed. It was not long before Lady (previously known as Cloud) became my daughter’s best and dearest friend. My husband was Mr. Mom at the time and we homeschooled our daughter (another story for another time). So it was that they faithfully went to the barn daily to muck stalls and work with Lady, get her more acclimated to being handled, groomed, saddled, ridden etc. Since I was the one with the horse training experience, I would give my husband and daughter some tips and they would implement them into Lady’s daily program. Hubby came up with some good techniques of his own as well! Soon Lady was pretty “bombproof” – in horse people lingo that means that nothing much bothered or scared her. After several years of being at the barn faithfully and helping out where we could, chores, stalls, laying concrete, fixing fences, installing fence posts etc. for some reason, our relationship was starting to decline with the woman who had offered this pony to us so freely. It occurred to me that if we were ever asked to leave, that this pony that was so near and dear to all of us was in fact, not technically ours. I prayed that the Lord would make a way for this woman to offer us the pony and, or that He would soften her heart towards us. Well the time came when I sensed that she was getting ready to sell a few horses. In my heart I knew that Lady was one of them. I prayed and then asked her how much she wanted for Lady. She said $400.00 well, at the time we were on a very tight budget. My husband drives to client’s offices to repair machines and our car had just died. We had to buy a relatively new one that would be reliable and large enough for my husband to carry his equipment, parts and tools in. Needless to say, this put a huge dent into our cash flow. Knowing there was no way we could afford to buy the pony on our own. I prayed again that the Lord would make a way. He put on my heart to ask my friends to help out via Facebook. Within 24 hours we had exactly enough money to purchase Lady! God is so good and my friends are so kind and generous! I was moved to tears! My daughters and I danced around the living room! Then, as suspected, a few weeks later, we were asked to leave. I still have no idea why, or what happened with the relationship but, am so thankful that the Lord allowed for her heart to be soft enough to allow us to buy Lady from her. Now Lady is an integral part of our ministry with these wonderful children and their families! So you see God is faithful no matter what things appear to be on the surface. Our ministry’s verse is Romans 8:28 And we know that all things work together for good to them that love God, to them who are the called according to his purpose. We have experienced this verse over and over again in our lives in real and mighty ways! God is always making beauty from ashes over and over again. He even uses our own mistakes and short comings to bless us for His good intents and purposes. How awesome is that?! Just think of it! If we had continued to just be at that other barn, day to day, happy & content with just helping out for the privilege of riding and working with Lady, we would never have had that “shove” to get our own place and start this ministry that we have been praying about for so very long! Until Next Time, Thanks so much for reading & God Bless! President and Co-Founder of The Lord’s Lead Line (Pending Non-Profit 501(c)(3) status. This entry was posted in Christian Ministry, Horses and tagged Christian Ministry, Christianity, Horse, Horse Rescue, Horses, Non-Profit, Ponies, Pony, Special Needs. Bookmark the permalink.